On Tuesday night, I wanted to grab a quick dinner before heading to a Boston Bloggers meetup at Highball Lounge! I wanted something fairly close by and something cheap too! 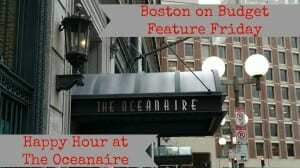 I decided to check out the Happy Hour at Oceanaire in the Financial District. 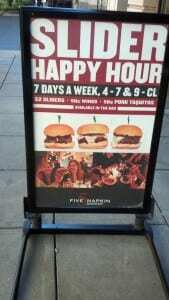 Happy Hour is from 4-7pm Monday-Friday and 9pm-close Monday-Thursdays and 8pm-close on Sundays at the bar. 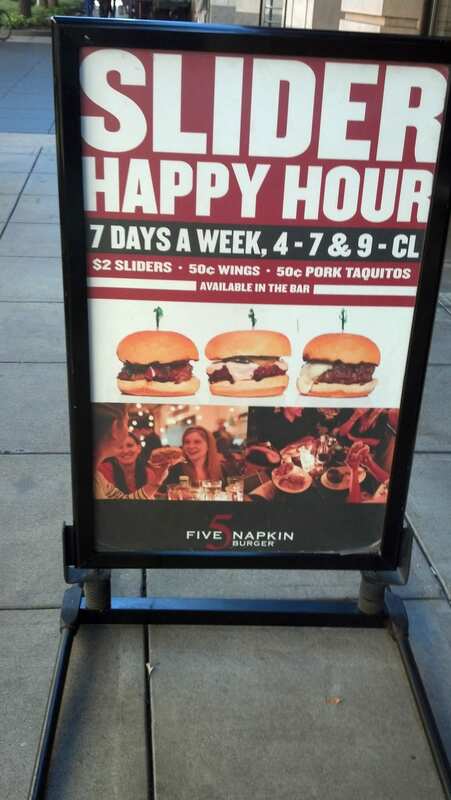 The happy hour menu has items starting at $5 from fish tacos, shrimp and chips, and much more. I was a little nervous after I arrived and checked out the bar menu because the prices were higher than the prices I found online by a few dollars. However, the online happy hour prices were reflected in my final bill, which was a nice! Whew. I ordered Shrimp & Chips ($5) and wine ($9) and my husband ordered Fish & Chips ($5) and a bottled beer ($6). The food was good, although it took forever to arrive. The french fries were delicious and crispy, which was good because they seemed never ending compared to the two pieces of fish and three pieces of shrimp we each got. But for $5 and an easy dinner I didn’t have to cook at home, I really can’t complain. Have you been to the happy hour at Oceanaire before? For more cheap eats, make sure to check out my cheap eats page here! In honor of the Red Sox back for the season, my April Feature Friday posts will be Red Sox themed! For my final How to Save at Fenway Park series post, I wanted to make one complete guide to make everything a little easier to find! If you want to read one section in depth, you can find Where to Eat for Cheap Near Fenway, How to Buy Cheap Red Sox Tickets and How to Park for Cheap on Game Days! There are so many different ways to save at Fenway Park. When I was growing up my Dad would get free Red Sox tickets from his work, and we would eat dinner super early at home on Red Sox nights. We were only allowed one item each to buy at Fenway, which was always Ice Cream in the little helmet. Ice Cream AND a Souvenir all in one, sold. I was one smart kid. Last year when we were heading to Fenway, running late, there was another couple chowing down home-made sandwiches for dinner during their walk. I thought it was a great way to save money in a time crunch, and I might steal the idea in the future since eating at home beforehand isn’t always an option. You don’t need to eat in Fenway Park, pay a lot for tickets or park right near Fenway to enjoy a Red Sox game. There are so many things you can do to save money even if you don’t get free tickets through work or eat beforehand. Also, the Red Sox have a few promotions that can sweeten the deal. The Red Sox have $9 tickets (plus ticket fees) for College Students as well as six college nights this spring. Also, active and retired military can receive special pricing for select Red Sox games, as well as first responders. I like to buy tickets through the Red Sox and combine promotions when possible to get the most value. For example, I went to a Red Sox game during the beginning of the season and purchased tickets in the winter then they were waiving ticket fees for one day only. It was a weekday game in April and tickets started at $10 for Upper Bleacher. It was also Ortiz Bobblehead night. For $20 exactly, I got two Red Sox tickets, two Ortiz Bobble heads and be at the Red Sox first home game win! 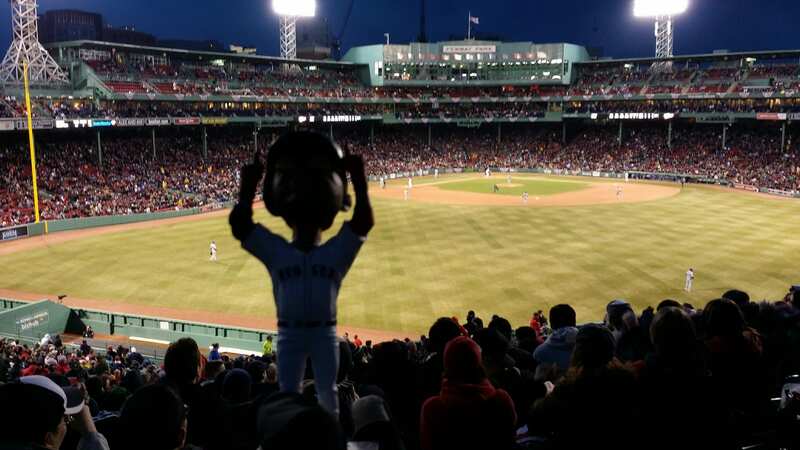 Combining offers are a great way to save money on Red Sox Tickets; however, you do need to have some flexibility since $10 Red Sox tickets and Bobble head night is not an every day occurrence (unfortunately). Sometimes tickets through Third-Party sellers like Ace Tickets can be cheaper or similar to face value when you include ticket fees into the mix. The best value for Red Sox tickets really depend on the night and variables. Weather can also pay a huge factor in ticket prices, and they can change suddenly on third-party sites very quickly, for better or for worse. Scalping is illegal in Massachusetts; however, there is a legal scalping zone at Gate C 90 minutes before the game. Also, the sale of tickets start 90 minutes before a game at Gate E and fans can wait up to 5 hours in line. However, game day tickets can be dicey, and it may not be the cheapest tickets available. Plan ahead to save money on tickets or wait until after the game starts (if you can chance it) to see if you can get a good deal somewhere. Just because beers are expensive in Fenway, doesn’t mean you can’t get an adult beverage for cheap near Fenway. You can also find cheap food near the ballpark before or after the game. You may just need to do some research beforehand since many bars and restaurants don’t advertise their promotions. To see every deal in depth, check out my Fenway Cheap Eats post or my late night cheap eats post for late night deals after the game. The further you go from Fenway the better deal you may find. However, as you can see from my previous experience, I was able to eat right by Fenway and found some cheap eats. You just need to get there early enough to make sure you can get a seat, since it gets crowded. I also had a cheap eats backup plan just in case it was too crowded. 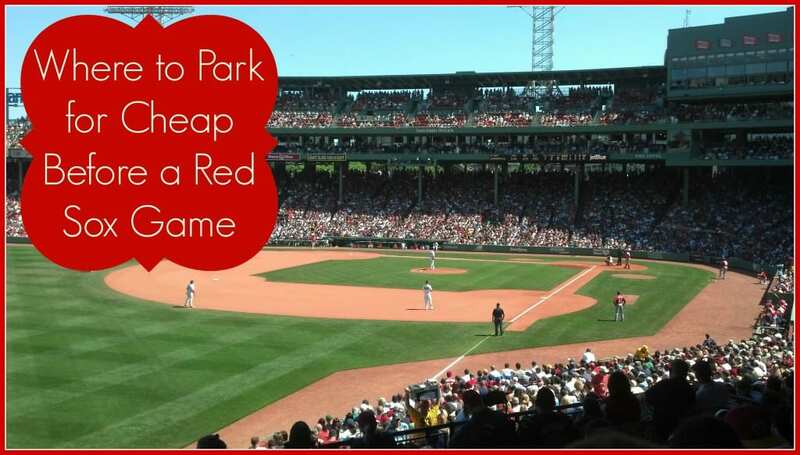 There are many ways to get to Fenway Park as mentioned in depth on my Where to Park for Cheap Near Fenway post. The best option can vary from person to person and also depends on where you are coming from. MBTA– The MBTA is a great (but very crowded) option, especially if you live near a station and/or already have a monthly pass. The T is $2.50 per ride per person with a paper ticket and $2.00 per ride with the plastic Charlie Card. However, there may be a 5% fare increase starting in July, 2014. MBTA Parking Garage rates and availability differ from station to station. However, parking ranges from $4-$7 depending on the garage. Take the B, C or D Green Line to Kenmore (any except the E Line) and follow the signs to Fenway Park. If you are taking the commuter rail in from Metro West, the Framingham/Worcester Line stops at Yawkey Station. Commuter rail prices vary depending on location and distance. MBTA Bus– There are multiple bus routes that have stops near Fenway Park and you can find them here. Fares are $1.50 with ticket or on board and $1.25 with Charlie Card. Pedicab– Take a pedicab to a Red Sox game: A bicycle cab. Pedicab drivers work solely on tips, so make sure if you do take a Pedicab to the game, don’t save money by not tipping enough. A Cab– This option will vary depending on where you are coming from. However, you can enter your estimated locations here to have an idea how much a cab will cost. Lyft, Uber, Sidecar– Lyft, Sidecar and UberX are car sharing services that pride themselves with being cheaper than a taxi. However, they do have peak rates during high demand times, and can vary depending on demand, distance, etc. I like to have all three downloaded on my phone and then check availability. New users can get a free $10 Lyft Credit with my referral link or new users can sign up with Uber to get a free $20 credit with my referral link. ($20 credit for a limited time and then will switch to $10, fyi). This can be a budget-friendly option especially if you have some free credit to use! Driving– The closer you are to Fenway Park, the more you will pay (and the more you may need to wait to get on the highway). If driving in is your best option, consider parking further away from the ballpark to save more money. Obviously, the cheapest option is finding a free street parking spot, but you definitely need a back-up plan unless you have a secret spot or tricks. Meter Parking: This can be risky, but can be an inexpensive option, especially for night games. Parking further away from the ballpark may give you more options and make sure to read parking meter signs for restrictions and timing. For some specific ideas of where to looking for spots, check out this post here, however, I am assuming a lot of these spots fill up fast! MFA: MFA Members can receive discount parking at the MFA garage. $13 after 5:30pm for members only. Approx .9 miles from Fenway. Garage at 100 Clarendon: Apparently the Official Parking Garage of the Boston Red Sox but it is also a hike. $10 parking after 3pm Monday-Fridays and enter after 7am on weekends with ticket stub. Approximately 1.3 miles from Fenway Park. SpotHero App: A smartphone app that allows you to find available parking garages and pay directly through your phone! No cash needed! New users can get a free $5 credit with my referral link here. Available parking garages may vary. Also, ask friends and family for suggestions for parking because they may be able to give you some suggestions or tips based on their own experience. There are so many different ways to save at Fenway Park. As mentioned through the post I went to a game early in April. I bought two Upper Bleacher tickets for Ortiz bobble head night for $10 a piece and didn’t pay ticket fees. I arrived early and got a free parking spot on the street and then went to the Yard House for dinner and drinks beforehand. We didn’t buy anything in the park. We could have done Fenway Park cheaper, especially if I had packed dinner beforehand, but we decided to eat out before the game. 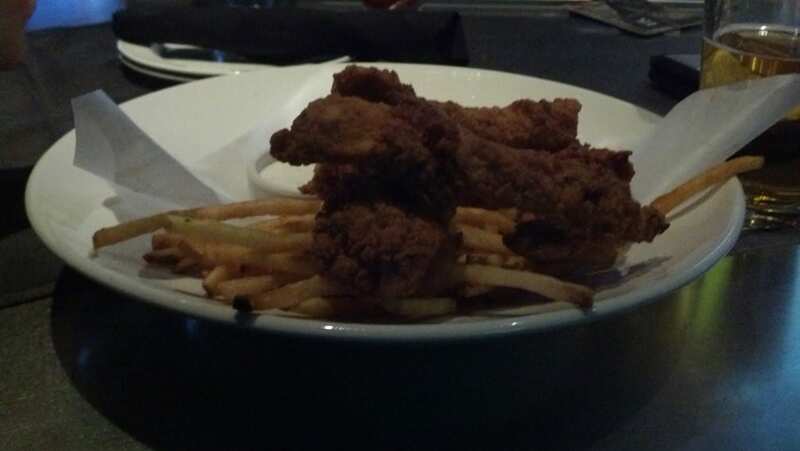 The total cost we spent was roughly $52– $20 for tickets and $32 at the YardHouse for Chix Fingers & Fries, Sliders & Fries, Two beers, and gratuity. Transit was free, since we walked from my free (and legal) parking spot. Not too bad, especially since parking, food, or tickets can be $50 alone. 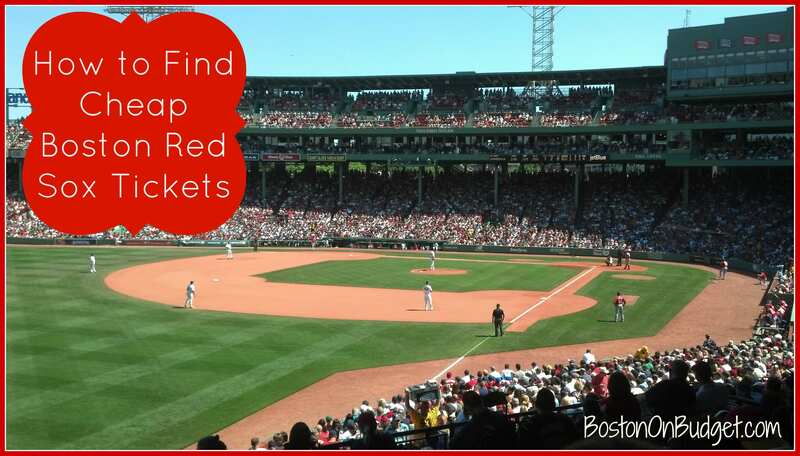 Do you have any tips for saving at Fenway Park or for purchasing Red Sox tickets? What did I miss? Have you done Fenway Park for a lot cheaper than me? *This post does contain an affiliate link for Ace Tickets. Please read my disclosure policy here. This post is getting old. You may like How to Find Cheap Red Sox Tickets and Game Day Parking, published April of 2017! In honor of the Red Sox back for the season, my April Feature Friday posts will be Red Sox themed! If you missed my previous posts Where to Eat for Cheap Near Fenway and How to Buy Cheap Red Sox Tickets, make sure to check them out! 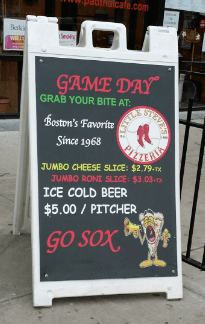 So now you have red sox tickets and know where to eat beforehand, but how do you get to Fenway Park on a game day on a budget? There’s a lot of different options, and it will definitely vary depending on where you’re coming from. Parking can be a very sensitive topic in Boston and one I rarely cover on the blog. However, I want to give you a few different options of how to get to Fenway Park without spending too much. There are other options than paying $50 right by the ballpark. I won’t get into very specifics in some areas (don’t steal my spot) but enough to hopefully help you out! Walking— If you are close enough to walk, we will assume you know how to get there. If you are staying at a hotel nearby, ask the front desk for directions and travel recs. Walking is free, so it is the cheapest option! MBTA— The MBTA is a great (but very crowded) option, especially if you live near a station and/or already have a monthly pass. The T is $2.65 per ride per person with a paper ticket and $2.10 per ride with the plastic Charlie Card. MBTA Parking Garage rates and availability differ from station to station. However, parking ranges from $4-$7 depending on the garage. Alewife (Red Line), Quincy Adams (Red Line), Riverside (Green Line), and Sullivan Square (Orange) are popular garages but there’s also other options. MBTA Bus— There are multiple bus routes that have stops near Fenway Park and you can find them here. Fares are $2.10 with ticket or on board and $1.60 with Charlie Card. Pedicab— Take a pedicab to a Red Sox game: A bicycle cab. Pedicab drivers work solely on tips, so make sure if you do take a Pedicab to the game, don’t save money by not tipping enough. A Cab— This option will vary depending on where you are coming from. However, you can enter your estimated locations here to have an idea how much a cab will cost. Uber and Lyft— Lyft and Uber are car sharing services that pride themselves with being cheaper than a taxi. However, they do have peak rates during high demand times, and can vary depending on demand, distance, etc. Driving— The closer you are to Fenway Park, the more you will pay (and the more you may need to wait to get on the highway). If driving in is your best option, consider parking further away from the ballpark to save more money. Obviously, the cheapest option is finding a free street parking spot, but you definitely need a back-up plan unless you have a secret spot or tricks. SpotHero App: An smartphone app that allows you to find available parking garages and pay directly through your phone! No cash needed! New users can get a free $5 credit with my referral link here. Available parking garages may vary. Parking Panda: Parking Panda is similar to Spot Hero and can be used on your phone to find and pay for parking spots. Head here to get a free $5 credit for new users! There are also other smaller parking garages further away from Fenway Park that may be a good option. Leaving plenty of time and getting there early is a great way to find a free street spot or a cheap parking garage as the cheapest options tend to fill up first! Also, ask friends and family if they have any recommendations of how to get to the game. My favorite parking spots and tips in the city are suggestions from friends and former co-workers. They are more likely to give you specifics than strangers on the internet that afraid you’ll get there before me and then steal my spot. If you do have any parking suggestions near Fenway or other transport options that I forgot to mention, feel free to leave them in the comments if you do not have a fear of people stealing your spot. Have fun at the Red Sox game if you do go! GO SOX! How do you save on Boston Red Sox Tickets? In honor of the Home Opener Game today at Fenway Park, I’ve compiled a complete guide of ways to save on sox tickets! This is the first year the Boston Red Sox are doing ticketing on a tier-system. Basically, low demand games (like a weeknight April game) will be lower than high demand games (like a weekend Yankees game). There are five tiers– tier one is the most expensive tier, tier four is the second least expensive tier and Sox Saver games are the least expensive ticket option for Fenway. You can check out all Red Sox tier pricing here. Also, each section will also have different prices based on how great the seats are. Upper Bleacher is the cheapest option*, which starts at $10 and Field Box is the most expensive (not including premium tickets) option with tickets up to $165 for tier one seats. Seating at Fenway Park will vary based on preference and budget. Keep in mind that Fenway Park is an older stadium so there are seats that have obstructed views and not directly facing the field; however, when you purchase tickets on RedSox.com there should be a little red asterisk warning you of the obstructed view. If you would like to have an idea of your view from different areas of Fenway Park, you can place your seats in the Red Sox seating chart to give you a good idea of the seats. Bleacher, Standing Room only, and Grandstand seats will be your cheapest seats. As someone who frequents Fenway on a Budget, I have no problem sitting or recommending Upper Bleacher seats for $10! It’s a fun atmosphere and you can still see what is happening during the game without binoculars! Bleacher seats are definitely more fun in the summer though, since it is much warmer– just remember to bring your sunglasses for day games! As mentioned above, Red Sox tickets are on a tier system so prices will vary depending on date, opponent, weather, etc. If you are local and have a lot of date flexibility, you can usually find a great deal on sox tickets at some point during the season. However, if you are visiting Boston this summer and only have one or two dates available, it may be more expensive, especially if you only have weekend availability. However, that doesn’t mean you can’t find a great deal on Red Sox tickets. The first place to look is the Red Sox’s website for tickets. Tickets will be at face value, but you will need to pay a ticket processing fee. Convenience fees are $4.50 per ticket and then a flat processing fee of $7 per order. So if you buy 2 tickets to a game, you would need to add on $16 in ticket fees. In years past, it was nearly impossible to find tickets during the season but there are still game tickets available. Check the Red Sox website first for tickets. Popular games and/or summer games may be harder to come by, so make sure to check availability soon. College students can also attend College Nights for $20 seats and there are six college nights in April and May this year. Stop and Stop partnered with the Red Sox to offer Red Sox tickets for $15 to select games. However, you do need an unique password to receive the deal. In addition to tier pricing for regular seats, the Red Sox are also introducing dynamic pricing for Monster Seats. Prices will be set by the market in real time (like airline tickets). It will be interesting to see how expensive Monster Seats will be for rainy or low demand games! Monster seats are in no way cheap seats, but you may get a good deal this year and you get to sit on the Green Monster! Sometimes buying Red Sox tickets directly through the Red Sox may not be the best option. If tickets are sold out or you are looking for more options, check out third-party sellers. Also, tickets can sometimes be below face value, especially for low demand games. Keep an eye out on third-party websites for upcoming poor weather games or last minute seats, since you may be able to score a real steal on tickets. As mentioned, weather can pay a real factor in pricing. If the forecast isn’t ideal for baseball watching weather, you may find a huge price drop the day before or the day of the game. However, at the same time, you may notice prices go the other way too if the weather is more than cooperating! I like using reputable sources like StubHub for tickets. There are a lot of options so you can filter out tickets based on preferences and prices. If you are looking for last minute seats or will be traveling, make sure the tickets are available for delivery right to your e-mail! Also, SeatGeek is a great website to check out because it is a ticket aggregator (think Kayak.com but for tickets). It lists the price of tickets from multiple ticket agencies all on one page. This is a great way to see what the market is doing and what to expect to pay without going to a million different websites. Keep in mind that SeatGeek is a ticket aggregator and not a ticket seller, so you may want to do a quick google search on the ticket company it refers you to if you’ve never heard of the company before. Craigslist is another popular option for sox tickets, especially for cheap and/or last minute tickets. I’ve had friends that have been able to score below face value tickets from Season Ticket holders and others at the last minute. However, you are more likely to be scammed through Craigslist than other sources, so just be careful if you do go that route. Tickets can be bought the day of the game, but only a limited amount of tickets are for sale beginning 90 minutes before game time at Gate E ticket window. You can wait in line up to 5 hours in advance for tickets, but you do need to proceed into the stadium once you receive your ticket. This is not a guarantee way to buy tickets, and you do not know what seats are still available, if any. For more information for game day tickets through the Red Sox, please head here. If you are visiting Fenway Park from out-of-state and have visited other ballparks, you probably just showed up at the gate and got tickets right there at a decent price. I know I’ve done this for other major league baseball teams in the past, but the Boston Red Sox are a little different. You will run into a huge line and definitely a different experience from other ballparks. Buying online or beforehand is much more convenient in my opinion, and I’ve actually never bought at the gate myself because the line is so intimidating! As you can see, there are many different ways to save money on Red Sox Tickets this year. If you are visiting Boston and have a tight schedule, I would highly recommend getting your tickets in advance whether it’s directly through the Red Sox website or somewhere else. However, if you live or work near Fenway Park, you may want to try some different techniques. The best way really depends on you and how much flexibility (and budget) you have. Now your turn– what is your favorite way to save on Red Sox tickets? Do you have any tips to share for any first time visitors, fans, and myself? What did I miss? *This post does contain an affiliate links. Please read my disclosure policy here. For more Red Sox posts, please visit The Complete Guide to Saving at Red Sox Games and Red Sox Games on a Budget! Did you know that there’s a very cute Winery in Boston? 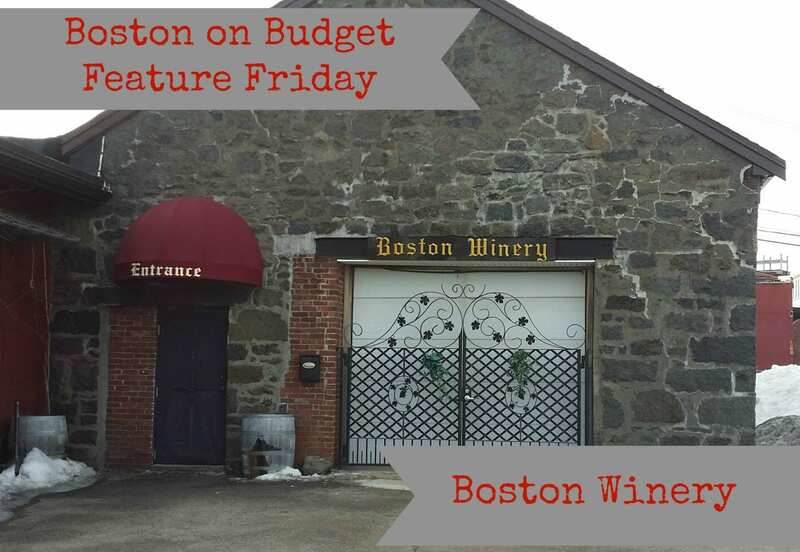 A few weekends ago I met up with a few other Boston Bloggers and we had a great time checking out the Boston Winery. Boston Winery is located at 26 Ericsson which is next door to Venezia Restaurant in Dorchester. There was plenty of (free) parking when I went on a Saturday afternoon. I have been to a few other wine tours and tastings in the U.S. and Italy, and the Boston Winery was bigger than I pictured. They had two good-size adjourning rooms: one for the tasting and one for the tour. We entered into the tasting room, and had a few glasses of wine before the tour. We later moved into the room for the tour where we learned about the wine-making process at Boston Winery for roughly 30-minutes. Boston Winery is open to the public for wine tastings and tours on Saturdays from 1-6pm with tours at 2pm, 3pm, 4pm, and 5pm. It is $10 and includes the tour and three tasting tokens for 3 samples/glasses of wine. Boston Winery also makes pizza but it does go quick (or at least it did when I was there). Before I went, I read on Yelp that the $10 tasting fee was waived if you bought a bottle of wine, but I am not sure if that is true or not. However, it doesn’t hurt to ask if you plan on purchasing a bottle of wine anyway. Overall I had a great time checking out the Boston Winery and wish I knew about it earlier when planning a bachelorette party! For more information about Boston Winery, you can head here. Have you been to the Boston Winery before? *I attended Boston Winery with some fellow Boston Bloggers and did not have to pay the $10 admission. All thoughts and opinions are my own.